For more than three decades, topical cocaine has been used to confirm the diagnosis and hydroxyamphetamine to localise the causative lesion in oculosympathetic palsy or Horner's syndrome. More recently, other drugs have demonstrated the ability to point to the diagnosis or anatomical site. Apraclonidine and phenylephrine, given their similar diagnostic efficacy and increased availability, may have superseded cocaine and hydroxyamphetamine as firstline pharmacological testing agents in Horner's syndrome. Thompson and Mensher1 described the topical use of cocaine to confirmthediagnosisofHorner'ssyndrome andhydroxyamphetamine to distinguish between pre-and postganglionic causative lesions. For almost 40 years, these drugs have been the mainstay of pharmacological testing in Horner's syndrome. Recently, however, other drugs have been studied that assist in diagnosing or localising the lesion. These include pholedrine, apraclonidine, adrenaline and phenylephrine. A Pubmed search combining each of these drugs with Horner's syndrome was conducted to ensure that recent, relevant evidence is included in the discussion of each drug. Unfortunately, the cocaine test has drawbacks: (i) some clinicians find it difficult to obtain the drug owing to its scheduling status, and in some countries it is not available at all; (ii) cocaine inhibits the uptake of hydroxyamphetamine from the nerve terminal and the two tests therefore cannot be conducted on the same day; (iii) metabolites of cocaine may remain in urine for up to 2 days after an ophthalmological test, which has implications for patients who may be subjected to a drug-screening test of their urine;5 (iv) sensitivity of the test is reduced in cases where the interruption of the sympathetic pathway is incomplete; and (v) the response in patients with dark irides may be extremely slow, and up to 3 hours should be allowed before interpreting the results. Hydroxyamphetamine belongs to a group of indirect-acting adrenergic mydriatics, e.g. tyramine, amphetamine and ephedrine.1 These drugs cause endogenous NA to be released from sympathetic nerve endings and therefore do not stimulate the effector cells directly. In 1971, hydroxyamphetamine (Paredrine) was readily available and widely used and therefore chosen as the drug of choice to distinguish between postganglionic and preganglionic or central causes of oculosympathetic palsy (OSP). If a central or preganglionic lesion is present, instillation of hydroxyamphetamine should cause mydriasis of the pupil, as the postganglionic neuron is intact and therefore able to release NA. Damage to the postganglionic neuron will result in less or no NA being released, and mydriasis will be incomplete or absent in response to topical hydroxyamphetamine. There are drawbacks regarding the use of hydroxyamphetamine: (i) it is no longer available commercially; (ii) the test cannot be performed on the same day as the cocaine test; and (iii) falsenegative results from a variety of causes have been reported in acute OSP.6,7 These have been ascribed to NA stores in postganglionic oculosympathetic terminals that are probably not yet depleted in the acute phase of the syndrome. Pholedrine is the N-methyl derivative of hydroxyamphetamine and has been suggested as an alternative drug in localising the causative lesion in OSP. In a study by Bates et al.,8 pholedrine correctly distinguished between pre-and postganglionic lesions in all 13 patients with OSP. The mean potency compared with hydroxyamphetamine is 0.62, and a 1% concentration has a similar effect to a 0.5% concentration of hydroxyamphetamine.8 Unfortunately, its use is restricted owing to its limited availability in some countries. Apraclonidine (Iopidine; Alcon, Fort Worth, Texas) is an alphaadrenergic receptor agonist normally used for the short-term reduction of intra-ocular pressure (IOP). Its IOP-lowering effect results from reduced production of aqueous humour via its action on postjunctional α2-receptors in the ciliary body. The α1-activity of apraclonidine does not affect aqueous production, but results in conjunctival vasoconstriction that is often noted with its use.9 In OSP, sympathetic denervation results in upregulation of α-receptors which, in turn, unmasks the weak effect of apraclonidine on α1-receptors in the pupil dilator muscle by causing mydriasis. Another drawback of apraclonidine is that up-regulation of α1-receptors takes between 5 and 8 days to develop,18 which explains why false-negative results may be obtained with apraclonidine testing in acute cases of OSP.19 The shortest reported latency period between sympathetic damage and a positive apraclonidine test is 14 days.14 Cocaine and apraclonidine are both useful in confirming the diagnosis of OSP, but cannot distinguish between pre- and postganglionic causes of the syndrome. Apraclonidine achieves its peak IOP-lowering effect 3 -5 hours after topical administration and has an elimination half-life of 8 hours.20 The duration of mydriasis is not specified, but additional testing to localise the lesion should be postponed by a few days because of the relatively long half-life of the drug. No studies addressing this issue have been published. Despite these limitations, many authors have recently suggested the use of apraclonidine as a first-line diagnostic tool for OSP, with cocaine being reserved for cases where apraclonidine testing is negative despite strong clinical suspicion. Adrenaline is a direct-acting sympathomimetic because of its structural similarity to NA that acts as the neurotransmitter in the sympathetic pathway. It therefore directly stimulates effector cells such as the dilator muscle of the pupil if the concentration is sufficient and causes mydriasis. Should denervation hypersensitivity develop, marked mydriasis will occur - even in minute concentrations of adrenaline, e.g. 1:1 000. Monoamine oxidases (MAO) A and B are located on the outer membrane of the mitochondria inside most neurons, including those of the sympathetic pathway, where they are responsible for the oxidative deamination of monoamines such as NA and adrenaline into the corresponding aldehyde and ammonia. Should a lesion that causes OSP affect the preganglionic neuron, MAO in the postganglionic neuron will still inactivate any adrenaline or NA present and, despite denervation hypersensitivity, neither pupil will dilate after the instillation of adrenaline 1:1 000. However, should the postganglionic neuron be affected, no MAO will be present to metabolise any adrenaline. As a result of denervation hypersensitivity, the affected pupil will dilate while the normal pupil will be insensitive to the low concentration of adrenaline. As such, adrenaline 1:1 000 may help to distinguish between pre- and postganglionic lesions causing OSP. Thompson and Mensher1 found that phenylephrine was more useful than adrenaline when testing supersensitivity of the iris dilator muscle, but they mostly used a 10% solution that causes extensive mydriasis even in a normal pupil. A study comparing pupil responses to phenylephrine 1% and hydroxyamphetamine 1% in 14 consecutive patients with OSP after previously confirming the diagnosis with cocaine 10%21 found that phenylephrine 1% increased pupil size in postganglionic OSP by a mean of 2.3 mm compared with 0.2 mm in the contralateral normal pupil. It proved to be 81% sensitive and 100% specific in dilating the pupil in postganglionic OSP. This compared favourably with the 93% sensitivity and 83% specificity of hydroxyamphetamine 1%. Given the limited availability of hydroxyamphetamine and the similarities in sensitivity and specificity of the two drugs in localising a lesion to the postganglionic neuron, phenylephrine 1% appears to be the more reliable and readily available alternative. 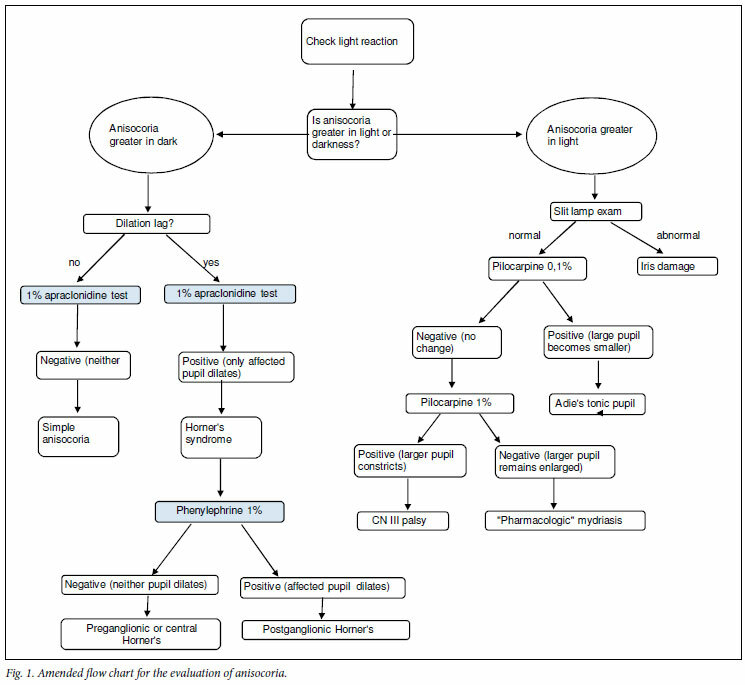 Thompson and Pilley2 compiled a flow chart for use in sorting out anisocorias. For more than 30 years, cocaine 2 -10% has been the gold standard in the diagnosis of unilateral Horner's syndrome and hydroxyamphetamine 1% recommended to localise the causative lesion. As neither is readily available, drugs recommended for primary use in pharmacological testing of this syndrome are being reconsidered. It seems that apraclonidine 0.5% or 1% is a suitable alternative to cocaine in confirming the diagnosis of OSP, and that phenylephrine 1% is a reliable and readily available alternative to hydroxyamphetamine. I therefore propose an amended flow chart for anisocorias (Fig. 1) and support the use of these drugs as first-line agents in unravelling the intricacies of Horner's syndrome.